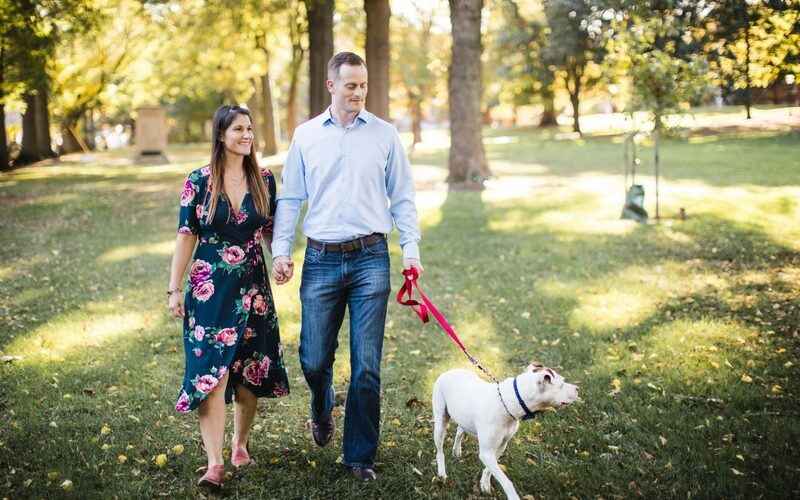 I met up with this couple and their adorable, energetic dog, for a special engagement session a couple months ago and we had a wonderful time wandering the streets creating this bright, airy set of images. We had beautiful weather and a surprisingly cooperative pooch (as long as he didn’t have to sit in the leaves for too long). The “family-style” engagement session is one of my favorite kinds of engagement sessions, because it lets me highlight more than just that nebulous loving feeling the couple feels, but also the network of roots connecting those feelings. Our canine friend may not have been a little kid, but he brought much of the same kind of energy to this engagement session. We had an amazing time together. Downtown Annapolis is a long-time favorite spot for portrait sessions of all kinds. The city offers so much variety, from beaches, to city streets, to big open campus space. Just about anything you want to do with your photos can be done right here, and it’s just up the road. Check out some of my favorites from this session below, and if you’re looking for someone to take pictures of you and your loved ones, check out the Portrait Photography page here on our website for more info! We’d love to hear from you!